How much do you know about the annual Air Force Charity Ball? Here are a few of the questions that people have asked over the years and the corresponding answers. How is the Air Force Officers’ Spouses’ Club (AFOSC) connected to the Air Force Charity Ball? The AFOSC provides the volunteer manpower to organize and host the Charity Ball. The AFOSC receives a small portion of the moneys raised to go into their welfare fund for scholarships and disbursement to charities. What is the Air Force Charity Ball and when was the first one held? The United States Air Force Charity Ball is an annual gala that was started in 2004. That year, Air Force Officers’ Spouses’ Club of Washington DC (AFOSC) created a special committee to host a charity ball to benefit the Air Force Aid Society, the official charity of the U.S. Air Force. What is the Air Force Aid Society? Who do they help? The Air Force Aid Society (AFAS) is the official charity of the United States Air Force incorporated in 1942 as a non-profit organization whose mission is to help relieve financial distress of Air Force members and their families and to assist them in financing their higher education goals. What usually happens at the Air Force Charity Ball? The evening begins with a social hour where you can view items offered in the Silent Auction, then moves on to a wonderful meal. During dinner you will get a chance to hear a few of the many moving stories about Airmen who have been helped by the Air Force Aid Society. The evening wraps up with a little dancing. It’s a great way to join with others to support and highlight the important role that the Air Force Aid Society has in the lives of our Airmen. The Silent Auction is one of the highlights of the evening! It includes unique items and experiences donated by our supporters around the world. We use a mobile bid system that allows guests to follow the progress of the auction and continue to bid on their cell phones as they enjoy the rest of the evening. The Silent Auction gives us the ability to raise additional funds to help Airmen while taking home a “treasure” at the end of the night! Is there one set price for tickets? How much are tickets? There are two price levels. One for enlisted guests -$100 per person and all others – $150 per person. I would like to volunteer to help the day of the event. Is this possible? We welcome volunteers on the day of the event! This event requires an army of volunteers to make it successful. Interested volunteers can contact the Air Force Charity Ball volunteer coordinator at volunteers@airforcecharityball.org. Can groups and organizations volunteer on the day of the event? Yes, in the past we had ROTC and Junior ROTC programs from universities and high schools in the local area. It is a great way to give back and meet senior leadership of the Air Force. Who can attend the Air Force Charity Ball? Anyone can attend the Air Force Charity Ball. You do not need to be affiliated with the Air Force. No formal invitation is needed. You just need to purchase a ticket. I can’t attend Air Force Charity Ball in person, but I’d still like to support the event. What can I do? 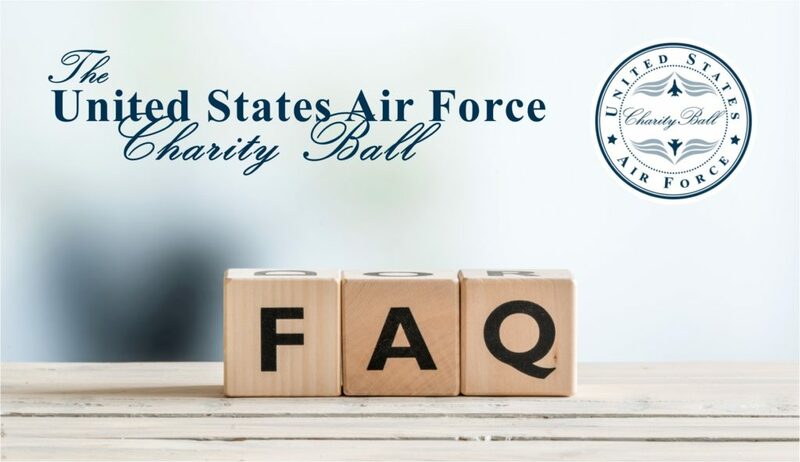 In the past, most people who cannot attend make monetary donations through our airforcecharityball.org website or they donate an item to the Silent Auction or Raffle. If you have something to donate or know of a business who would life to sponsor an item, send an email to silent.auction@airforcecharityball.org or corporatesponsors@airforcecharityball.org. How much money has been raised in total since the first AF Charity Ball was held? Since its inception, the gala has generated over $8 million and become one of the largest fundraisers for AFAS. The money raised directly supports Airmen and their families. Additionally, for every $1 donated, AFAS provides $3 in support to USAF service members & their families. Bottom line, the Air Force Charity Ball happens because of the AFOSC and benefits Airmen around the world through the Air Force Aid Society. Won’t you join us in supporting this worthwhile event? If you’d like to volunteer, contact volunteers@airforcecharityball.org. If you’d like to make a donation for the Silent Auction, contact silent.auction@airforcecharityball.org.